How to create your own free iPhone ringtone from any audio, video file? 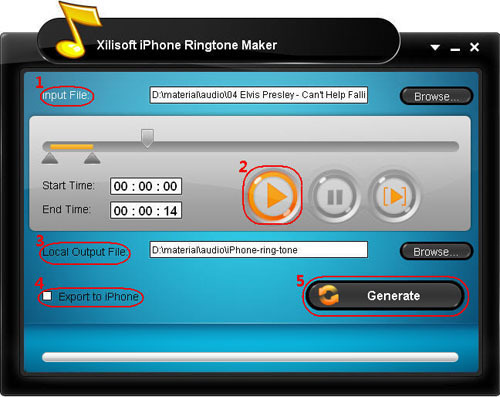 Xilisoft iPhone Ringtone Maker is a smart and easy-to-use iPhone ringtones software for iPhone users to create your own free iPhone ringtones. With it, you can create custom ringtones for iPhone from almost all audio and video files. Step 1: Download the iPhone ringtone creator (Windows version or Mac version) and install it. Click "Browse..." button to select a audio or video file. Step 3: Pre-listen and set audio segment. Click "Play" button, then drag and drop the start and end slider to get the audio clip you want. Step 4: Click "Browse..." button to choose a destination folder. Step 5: Check "Export to iPhone" to set "Export the created ringtone to iPhone directly". Click "Generate" button to start to create your ringtone.